Is it still harder for women to attain professional power? Women can be great leaders and this report testifies the rise of female executives. 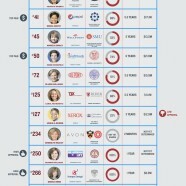 See the 18 CEO women who heading Fortune 500 companies. However, discriminations are right on the next corner as far their earnings compared with men ceos.